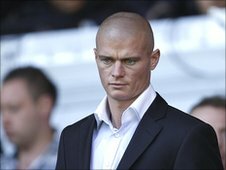 Liverpool have completed the signing of left-back Paul Konchesky from Fulham on a four-year contract. Reds reserve duo Lauri Dalla Valle and Alex Kacaniklic have moved in the other direction as part of the deal. Konchesky, 29, was at Anfield to watch their win over West Brom on Sunday and is familiar to Reds boss Roy Hodgson from their days at Craven Cottage. With Konchesky arriving the Reds have allowed Emiliano Insua to join Turkish side Galatasaray on a season-long loan. Galatasaray have the option to make the deal permanent for Insua, who was Liverpool's regular left-back last season but has not figured for the side under Hodgson so far in the current campaign. Instead, the Liverpool manager has opted to use regular central defender Daniel Agger on the left side of defence in the club's league games and Fabio Aurelio in Europa league matches. Why oh why are we being linked to the likes of Konchesky, L Young, Salcido? Konchesky will now reinforce the Reds defence and could make his debut in the club's next game against Birmingham on 12 September. The Barking-born player has two England caps and made his international debut in 2003. He was a West Ham academy trainee before leaving to join Charlton, and went on to make 169 appearances for the Addicks. In 2005, West Ham bought Konchesky back in a deal worth £1.5m and he made 62 appearances for the east London side. Hodgson is also hoping to add another acquisition before the transfer window closed at 1800 BST on Tuesday. But the 63-year-old Reds boss moved to cool speculation that it would be PSV Eindhoven forward Ola Toivenen he would be signing. "If we can I'd like to bring in one more player and that would be excellent," said Hodgson following the 1-0 win over the Baggies. "We are short [in the striking department] so we don't need to disguise the fact that it would be nice to get a striker but they are very hard to come by. "If the right man comes along I know that the club are prepared to act but I don't want to act on the wrong man and just add another body to the club. "It would have to be someone who could really play alongside Fernando [Torres] and, in my opinion, improve us as a team. "I like Ola Toivonen but he's not the right type of player that we are looking for at the moment." Meanwhile, winger Nabil El Zhar has joined Greek club PAOK on a season-long loan. The 24-year-old has not featured at all for Hodgson since he took over. And reserve team midfielder Vincent Weijl has completed a transfer to Spanish side SD Eibar.